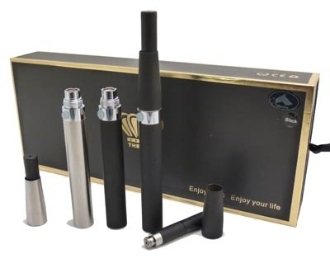 One of the best kits on the market, the eGo510 Mega Batteries Starter Kit features a powerful 1100mAh battery that can be connected to a standard Joye510 atomizer. A fully charged battery could support a heavy smokers' needs for up to 2 full days. All it needs is 2-3 hours of charge time when the battery runs too low. Because this kit is compatible with Joye510 atomizers, cartridges, and cartomizers saving money is easy. Don't forget to refill your cartridges or cartomizers with our great tasting smoke juice as well.